Global Luxury Spa Hotel of the Year, Galgorm Spa & Golf Resort is situated only 30 minutes from Belfast; the perfect location to relax and get away from it all. 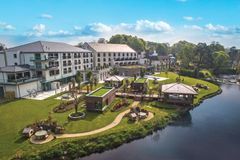 Set within 163 acres of lush parkland with the spectacular River Maine flowing through the estate, Galgorm Resort has a truly unique setting. Close to both Belfast airports and the stunning scenery of the North Antrim Coast, it is the perfect base to explore the region's most renowned attractions and world class golf courses; from our own parkland course, Galgorm Castle, to the famous links at Royal Portrush, home to the 148th Open. Choice is the key when it comes to Galgorm, with 8 event suites and breakouts, 4 award-winning restaurants, 122 guestrooms and cabins, the largest Thermal Spa in Europe and over 200 acres of grounds, enable us to offer you creative solutions. Galgorm Castle is one of Ireland’s finest Championship parklands and is the Home of the European Tour’s Northern Ireland Open. Galgorm Castle is consistently ranked among the Top-3 Parklands in Northern Ireland. Complimentary transfers to Galgorm Castle Golf Club! Complimentary access to the Thermal Spa Village! 1 in 20 goes free! As well as golf why not experience fishing on the River Maine, clay pigeon shooting, horse riding, or relaxing in the luxury new Spa facility which features wet and dry treatment rooms, thermal suites, hydro pool and outdoor hot tub. Golf can be played at Galgorm Castle Golf Club situated just 1 mile from the resort. After golf, enjoy a meal next to the large open log fires in the Gillies Bar & Grill, authentic Italian cuisine in Fratelli Ristorante, Pizzeria & Bar or fine dining in the River Room restaurant with the finest produce and selections of wines. Gillies Bar & Grill is perfectly suited for the weary golfers, where the warm welcome is only matched by the outstanding food and drinks. For something more refined, head to the River Room restaurant for an exquisite fine dining experience. Q - What restaurant do I need to book for dinner?